It has been oh so long since I have done any paper crafting. I wanted to do my youngest bedroom in a unicorn theme, but I also wanted to do it on a budget. 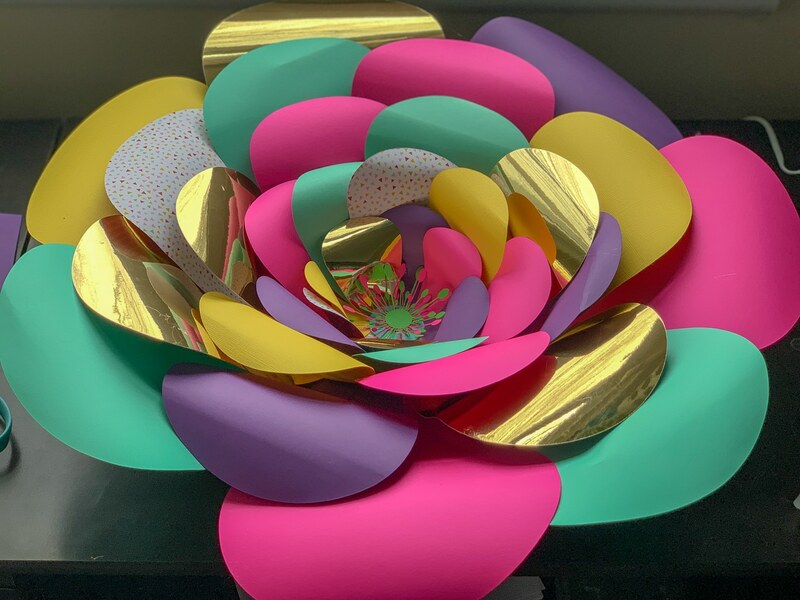 I thought giant paper flowers were perfect, but I needed to teach myself how to make paper flowers first. So went on the search for a flower template, I had an idea in my head of what I wanted and couldn’t find it. So I gave making my own template a shot. And my large paper flower came out beautifully! 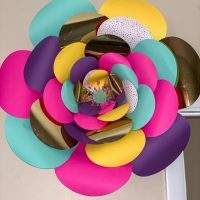 These diy giant paper flowers were really simple to do using my Cricut cutting machine, but hand cutting wouldn’t be bad. Next, I will be trying a paper rose, I just have to figure out where it will go. 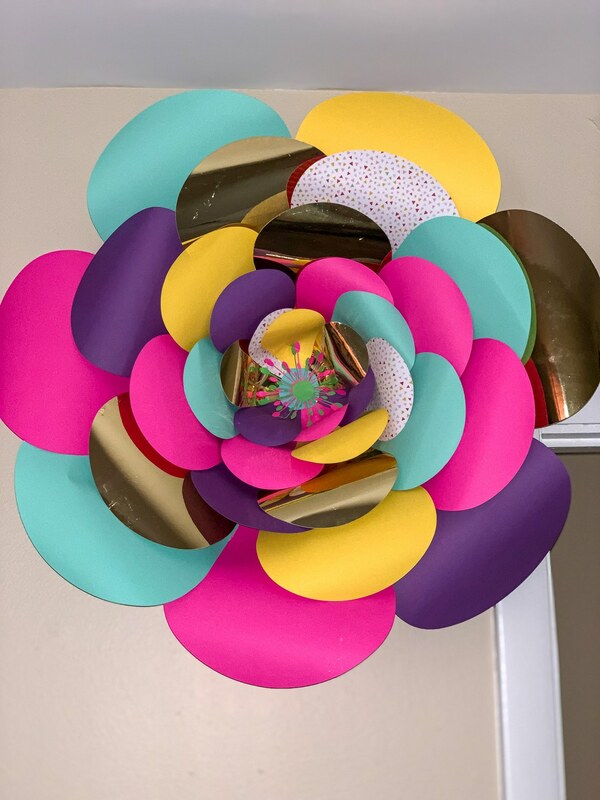 Because you are using card stock for these diy paper flowers, they will be much sturdier than the tissue flowers. 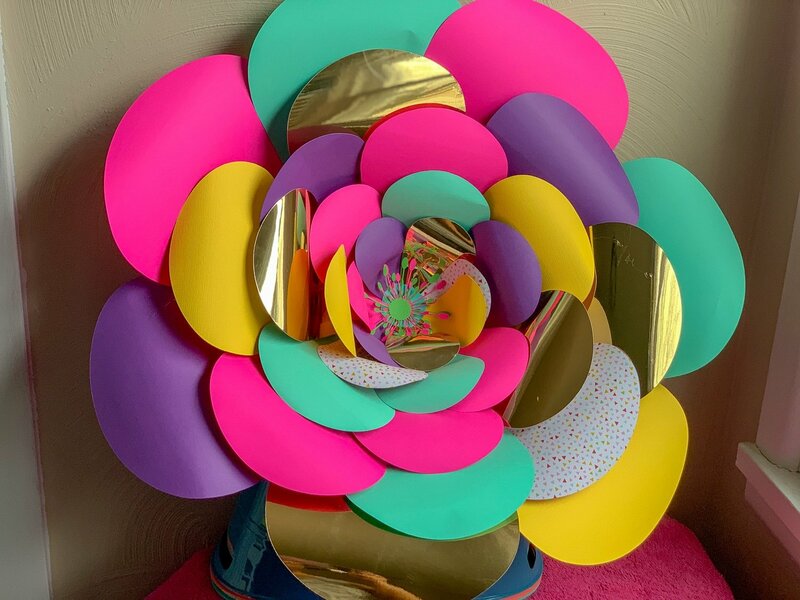 I have provided you with both the cut files, template and tutorial video that will help you learn how I curl the edges and also how to put the flowers together. What paper is used for paper flowers? I like to use a medium weight cardstock. It would be the same weight you use for things like cards, boxes, scrapbooking and other paper crafts. Now, just so you know if you are making smaller flowers you can use a lighter weight paper. What kinds of things can you use paper flowers for? Just let your imagination run wild with the things you can do with these amazing beauties! 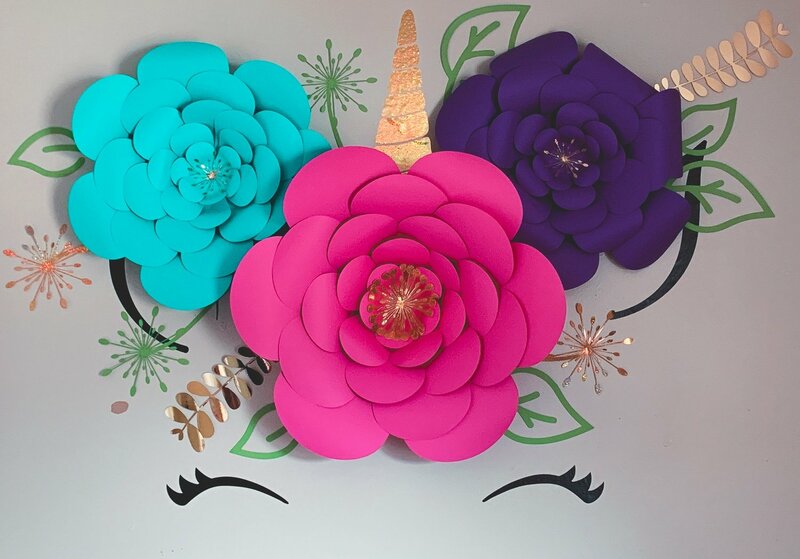 The look on my daughters face when she saw her unicorn flower was priceless! I am always happy to make her happy and the fact that I have the knowledge and the skill to use my Cricut to make these amazing creations makes it even better. If you don’t have a Cricut and love to craft, I strongly suggest you get one, I have been a user of Provo craft since the beginning. My first Cricut was the small little 6 inch and I now have the Cricut explore one and I have the Cricut maker coming. My T-shirt business was solely created using the Cricut, the first t-shirt order, I was still using an iron to press my design! Looking for more great Cricut crafts? I wanted to do my youngest bedroom in a unicorn theme, but I also wanted to do it on a budget. I thought giant paper flowers were perfect. To print the flower template to hand cut click here. The printable template doesn't include the leaves and flower centers. These are such a cute idea! They make the perfect affordable decor for a dorm room. Thanks for sharing.